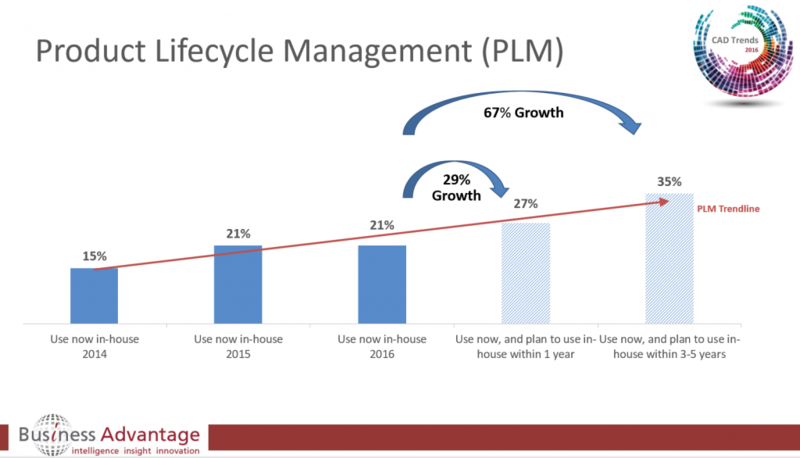 Key Insight: Strong growth predicted in both PDM (Product Data Management) and PLM (Product Lifecycle Management) for this year and through 2020. This post publishes more specific details on the PDM and PLM trends from the Worldwide CAD Trends 2016 Survey. PDM (Product Data Management) is the third most important trend in our annual CAD Trends Survey with Awareness of PDM increasing year over year from 47% to 51%, while Usage remained level at 28%. There is higher Usage in large companies (37%) compared to medium (30%) or small (16%) companies. There is predicted growth in both the short and longer term; Usage is predicted to grow from 28% this year to 39% over the next 3-5 years. Regionally there is significantly higher usage in the Americas (36%) than EMEA (24%) or APAC (20%). Faster time to market (28%). In the Manufacturing Sector (including Process and Power) PDM and PLM Awareness is 61% and 66% respectively, Importance is 7.4 and 7.0 respectively and PDM Usage (40%) leads PLM Usage (33%). in 3-5 years PDM Usage is forecast to increase from 40% to 51% (28% growth) and PLM Usage is forecast to increase from 33% to 50% (51% growth). In the AEC Sector (including Utilities) PDM and PLM Awareness is 35% and 39% respectively, Importance is 6.1 in both and PDM Usage at 15% leads PLM Usage at 8%. 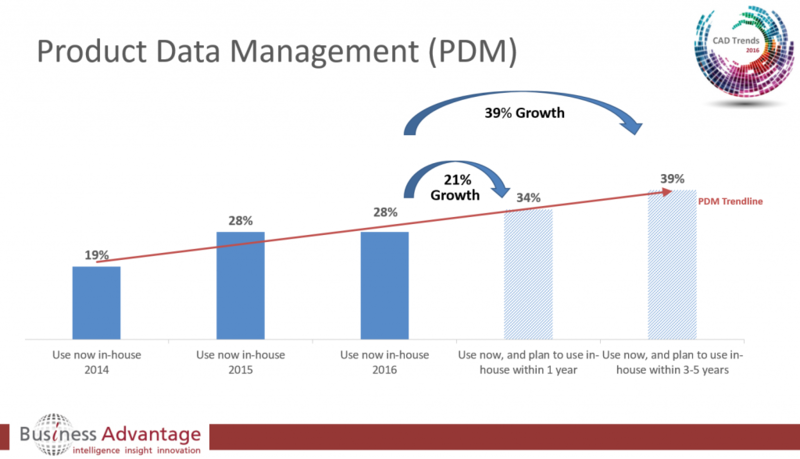 In 3-5 years PDM Usage is forecast to increase from 15% to 25% (67% growth) and PLM Usage to more than double from 8% to 21% (262% growth – although this is from a low base). By size of company: In large companies Usage of PDM and PLM is similar at 37% and 39% respectively but the smaller the company the more likely they are to use PDM rather than PLM. In medium sized companies PDM Usage (30%) is nearly twice (88% higher) than PLM Usage (16%) and in small companies PDM Usage (16%) is 60% higher than PLM Usage (10%). Naturally the report is a high level summary of insights gained from the data gathered and this series of blog posts enables us to add further detail but if you are interested in still more detail, such as information on the PDM and PLM trends by region, industry or software vendor, give us a call to chat with a research executive about your needs.